Flower (Toughness: 9) - Fast, flying, and super tough. Releases small flowers which chase directly after you. In the next room after the starting room, in the higher ? box. Score adjustment with the enemies should not be a problem even without the P power, because there is a telephone booth in the room, with which you can change into Genzoh if needed. To get rid of icons before opening the Secret Bonus, use the ? boxes beyond the two-way ON gate. Some distance up above the Secret Bonus. It's apparently surrounded by walls, but you can reach it through a fake wall in the lower left corner. Be careful about the umbrella. Also, don't hammer the jar until you've confirmed that you are entirely in the room, and that any extra life you earned from the fake wall has been counted. Scene 8 is the final scene. 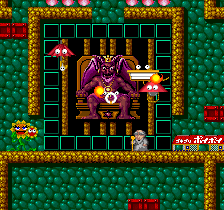 Enemies from every previous scene join the dangerous and tough flowers in an all-out attack against the Espers. You start in a large room with a dangerous flower. Plus, a dangerous lunch box appears when you go to the left. A beginner who is not seriously after the score is advised to get out of this room quickly, going through the fake walls or otherwise. 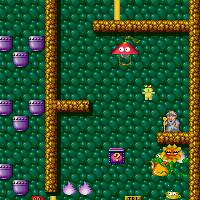 The food pots in the right column are quite safe to get, but you will have to face the dangerous enemies if you want to get the ones in the left column. After going through the ON gate, you'll be in the room with the Secret Bonus. After finishing whatever score-oriented tasks you may want to perform, change into Akiko at the telephone booth and carry on. Don't forget to get the Magical Bonus on the way. The path till the next telephone booth is easy, but the climb ahead is full of peril. To give yourself more leisure for the climb, banish the cigarette pack by hovering in the magic spot in the upper left corner. There are basically 2 ways to climb through the vertical corridor with 3 moving boxes and some fires (all real ones) lining the side walls. One is to ride the broom. The other is to use Makoto and try to get through it all in one jump, avoiding the moving boxes. Jump up from atop the telephone booth, land on the floor just to the left of the entrance, and quickly jump again at a good timing. The aim is to make it in one jump, all the way through all the hazards, without ending up standing on a moving box. If going for the broom, it is best to use Naoki, since the section until the next telephone booth is much easier with him. Riding the broom is the safer method unless you are running out of time. There are 2 moving boxes in the room beyond the ON gate. They are not too much of a problem if you wait for a good timing: get through when the lower box is on the right and the higher box is on the left. However, the entrance into the next room is very dangerous for Makoto, with a clock right in his way. Naoki has no problems because he can fit between the food pots and the right wall. Once the clock is banished, change into Akiko or Genzoh. Collect the food if you want, and leave as Akiko. 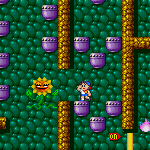 If you collect the food from right to left, the food pots will block the enemies so that you don't have to fight the flower too much. 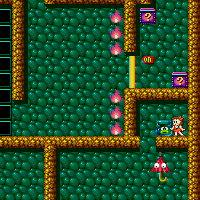 The next big room contains 24 food pots and a few threatening enemies. The ideal thing to do is to just fill all your 5 icon boxes, then leave for the group of ? boxes ahead and return later to collect the remainder of the food. Leaving a food pot to the upper right of the telephone booth makes it easier for Bunta to reach the exit, though it is not absolutely necessary. 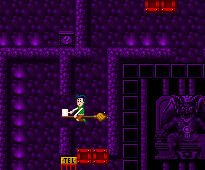 Since this room is near the top of the screen, it is a good idea to ride the broom for collecting the food. If you decide to use Genzoh instead, keep in mind that he cannot climb back up without either the broom or a food pot as foothold. When you've done everything else you want to do, change into Makoto and head for Satan's room. If you go through the vertical corridors without pause or hesitation, you can clear the high jump before the umbrella appears. A toughness of 240! The final Satan has more toughness than all the previous Satans added together! Needless to say, you must use Genzoh unless you have a special affinity for long, drawn out fights which never seem to end. However, Genzoh cannot reach the last ON gate unless he manages to ride the broom up the long vertical corridor. Luckily, there is a telephone booth in Satan's room. Use Makoto, and hit Zara just outside the ON gate. (Don't use the kids because it takes longer for a kid to change into Genzoh than Makoto.) Ride the broom to the telephone booth and change into Genzoh. In case the moving box is blocking your way to the telephone booth, you can go around it via a path through a fake floor (in the ceiling) and some fake walls. The fake walls can also be used to deploy a Stop icon! A collection of the foods from previous scenes. 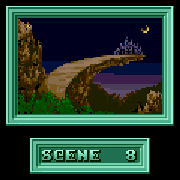 While scene 7 stiffly challenges the player with getting the Secret Bonus in the starting room, scene 8 challenges the player with getting a good start for the All Gold Bonus in same. It can even be said that if you get a perfect start in the starting room, the All Gold Bonus of 400 000 points (plus lots of points for high food values) is almost home. There are 25 food pots in the starting room. After that is the section with the Secret Bonus and other things. Clearly, if you don't want to maintain a modulus count across the Secret Bonus and such, you want to finish the starting room at a break point. The ideal way is to get sets 2, 4, 6 and 7 (with 3, 7, 5 and 10 foods respectively). If you manage to nail the above, you will be at a break point for the Secret Bonus, and there will only be 3 sets left, and you should not have much of a problem racking up the All Gold Bonus. If you don't, it is still possible to get the All Gold Bonus, but it will become much harder. This page was last edited on 13 December 2010, at 21:27.